A humerus fracture is an injury to the bone of the upper arm that connects the shoulder to the elbow. Humerus fractures are generally divided into three types of injuries based on the location of the fracture. The top of the arm bone is called the proximal humerus, and the bottom of the bone is called the distal humerus. In between is the mid-shaft of the humerus. Proximal humerus fractures occur near the shoulder joint. The shoulder joint is a ball-and-socket joint, with the ball being the top of the humerus bone. Fractures of this ball are considered proximal humerus fractures. These fractures may involve the insertion of the important rotator cuff tendons. Because these tendons are important to shoulder motion, treatment may depend on the position of these tendon insertions. Mid-shaft humerus fractures occur away from the shoulder and elbow joints. Most humeral shaft fractures will heal without surgery, but there are some situations that require surgical intervention. These injuries are commonly associated with injury to one of the large nerves in the arm, called the radial nerve. Injury to this nerve may cause symptoms in the wrist and hand. Distal humerus fractures are uncommon injuries in adults. These fractures occur near the elbow joint. These fractures most often require surgical treatment unless the bones are held in proper position. 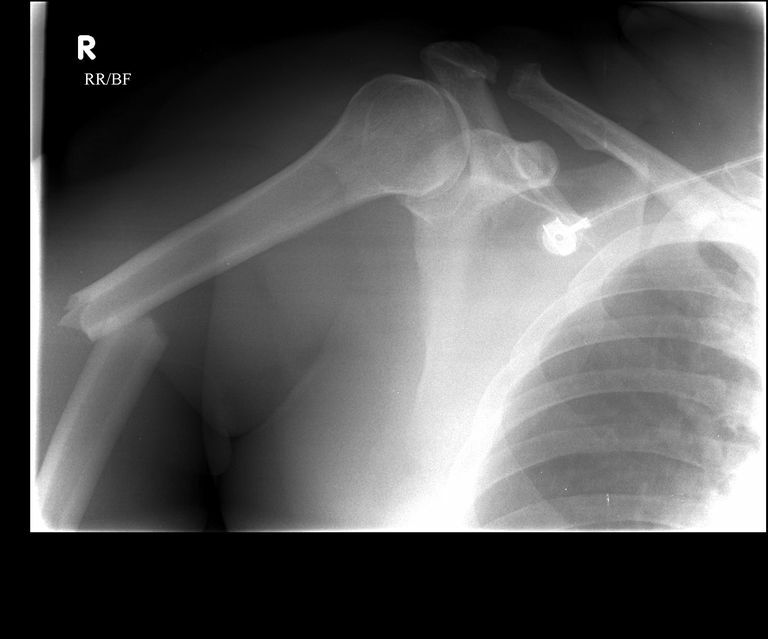 This type of fracture is much more common in children, but the treatment is very different in this age group. Humerus fractures can occur by many different injuries but are most commonly caused by falls. Other types of injuries that can cause a humerus fracture include automobile accidents and sports injuries. In addition, sometimes a humerus fracture occurs when the bone is weakened by tumor, infection, or other problems. This condition is called a pathologic fracture. The good news is that most humerus fractures will heal without surgery. The majority of patients can be treated with a sling or brace, and with time the fracture will heal. Casting is not possible with most types of humerus fractures. Surgery may be required when the bone fragments are far out of position. Determining when the alignment is acceptable depends on a number of factors. Fractures close to the shoulder and elbow joints, especially fractures that extend into the joint, are more likely to require surgery. Conversely, fractures in the center of the shaft of the bone rarely require surgery, even with the bone fragments appear not perfectly aligned. Nonunion: A nonunion occurs when the broken bone does not heal. There are many reasons why a bone may not heal, and treatment must ensure that the underlying problem that caused the nonunion to occur is addressed. One of the most common causes of nonunion is smoking tobacco. Malunion: A malunion occurs when the bone heals, but not in the proper alignment. Malunions can occur because the bone was not adequately immobilized. Sometimes surgery is performed to prevent the bone from healing in a poor position. Nerve injury: Nerves travel down the arm, and are closely positioned to the humerus bone. The radial nerve, in particular, is notorious for being injured when the humerus is broken. The radial nerve provides sensation to the back of the hand and may cause numbness and a tingle in that area. Most often the nerve will gradually recover over a few months time. Shoulder or elbow stiffness or weakness: Problems with the shoulder joint are common after a proximal humerus fracture, and elbow problems are common after a distal humerus fracture. Loss of normal range of motion is common, and weakness can also occur if there is muscle or tendon damage. Cadet ER, et al. Proximal Humerus and Humeral Shaft Nonunions J Am Acad Orthop Surg. 2013 Sep;21(9):538-47. Carroll EA, et al. Management of Humeral Shaft Fractures J Am Acad Orthop Surg July 2012 vol. 20 no. 7 423-433.